A 23-year old man was arrested in July 2015 for being the driver responsible for a motor vehicle accident that left one man dead and two others seriously injured near Hawkesbury, Ontario. The driver now faces a series of charges, including impaired driving causing bodily harm, impaired driving causing death, dangerous driving causing death and dangerous driving causing bodily harm. With the frequency of motor vehicle accidents in Ontario, most of us are aware that there is some risk of being in an accident every time we get behind the wheel. Many Canadians are involved in a fender bender at some point in their driving careers and feel fortunate when injuries are minor or even better, non-existent. However, all too often vehicular accidents result in catastrophic injuries with a permanent impact on an individual’s life, or death. Vehicular accidents are usually caused by a number of common factors, including distracted driving, driving under the influence, speeding and dangerous weather conditions. Distracted driving includes such activities as texting while driving, talking on the phone, talking to other passengers, eating, as well as any other activity that takes our attention from the road. Driving under the influence is self-explanatory and generally includes driving with more than the allowable amount of alcohol in our bloodstream, or under the influence of prescription drugs and/or illegal drugs. Similarly, speeding essentially means driving above what is the legal limit. Any of these situations impair a driver’s judgement and ability in some way. However, of them all, weather conditions such as snowstorms, resulting in poor visibility or a dangerous driving surface, are one of a few things over which we have no control. Another is the actions of a dangerous or careless driver whose vehicle strikes ours or otherwise causes us to be involved in an accident. Yet, even in the case of poor weather conditions, drivers can reduce the risk of a collision through defensive driving actions such as reducing their speed and having appropriate tires on their vehicle. In the recent trial of Giuliani v. Region of Halton, 2010, Ms. Giuliani was found to share the blame for her serious injuries arising from an accident on an icy road in Milton, because she did not slow down despite the known slippery driving conditions. The town of Milton was held partially responsible (50 per cent) for the collision for a failure to clear Derry Road, a well travelled street, from ice in a timely manner and with fair warning of an upcoming storm. Every day, we as drivers, have the ability to choose safe driving strategies over careless driving; the latter may include allowing ourselves to be distracted by our phones and other devices, driving home from a party while under the influence of alcohol, or driving at an unsafe speed. Unfortunately, individuals often make poor negative choices, and the outcome can be more terrible and far-reaching than a fine. The decision to drive carelessly can result in life-changing injuries to ourselves and innocent victims such as our passengers, the occupants of another vehicle, pedestrians or cyclists. Personal injuries such as brain and spinal injury, blindness and paralysis are more frequently caused by motor vehicle collisions than most Canadians realize. In the aftermath of a vehicular accident, finding the right lawyer to represent you is of great importance. An empathetic and skilled personal injury attorney will remove a great deal of stress from the lives of an accident victim and their family, while pursuing the best compensation that can be achieved for damages. If you or a loved one were involved in a motor vehicle accident, call the law offices of the Injury Lawyers of Ontario (ILO) serving Hawkesbury. We will determine whether you have a good case for damages, advise you of your rights, and build a successful claim for the benefits you deserve and are owed. 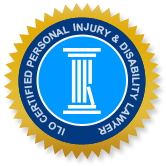 In addition to personal injury resulting from motor vehicle accidents, we specialize in slip, trip and fall cases, wrongful death, insurance disability claims, recreational accidents, dog bites, product liability cases, and other accidents that cause serious injury. Call or visit us for a free consultation and an honest assessment of your legal recourse.